Our school district has a summer reading intervention program, and buys some PermaBound books for this program every year. I am fortunate that they are housed in my library, because many of the titles are good for struggling middle school readers. They do consult me about what to buy, but usually only a few days before they need to place an order, so I am not able to be as careful about suggestions as I am about books I purchase. Here are a few of the titles that we recieved this year. Codell, Esme Raji. Sing a Song of Tuna Fish. This was alarming from my perspective, because it is a memoir, and I think Raji is younger than I am. An interesting picture of a particular time and place, and Raji's struggles with being young and dealing with her eccentric family. I'll have to see what the students think. LeUyen Pham's illustrations are always something that bother me-- they seema bit fuzzy and I always try to adjust my glasses. Gutman, Dan. Nightmare at the Book Fair. I liked this one-- just sort of goofy. Trip doesn't like to read, but gets caught by the librarian to help with book fair, gets hit on the head by a book, and travels through a variety of nightmares about different types of stories. Gutman has a huge following, and this has clever moments, such as when Trip comes back to consciousness ala Dorothy Gale and parrots the lines in The Wizard of Oz (movie version). I was a little alarmed that Gutman, a sports writer, would state at the beginning of the book that although Trip was in 5th grade, 5th grade was no middle school and he could be on a sports team. Maybe things are different in his state, but even our sixth graders aren't allowed to play sports. Moss, Marissa. Amelia's Guide to Gossip. I don't care much for these heavily illustrated, slim volumes, but the girls do. Amelia does experience many of the problems endemic to 5th and 6th grade girls, and the books are constructively informative, so well worth the purchase for this younger audience. There is another of these on bullying, and both give good information on difficult topics. Marsh, Carole. The Mystery at the Roman Colosseum. Eh. Had great hopes for this series, but was disappointed. This is number three-- perhaps I should reserve judgement until I can read the first two. I was a little wary because of the blurb on the front "Includes Five SAT words to know! "; readers at the level this book would indicate do not care. This one struck me as a bit wooden, but as I said, the first two books may help. Bryan, Nichol. Somali Americans. We have a large Somali population, and I think that this book will be a good introduction to the culture of that country and the problems that have caused so many people to leave. A mere 32 pages, it is also appropriate for ESL students who may be struggling with language. 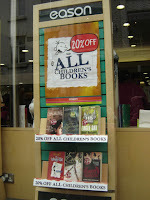 Since Wilson's books that are available in the US are so popular in my library, I picked upa number of them in Ireland. Warning: do not read a lot of these books in quick sucession. They do tend to get a bit same-y after awhile. Cookie. Well-to-do, stressed, abusive father. Ineffectual, pretty, passive mother. Frumpy, unhappy daughter. When father's tirades become too much, mother and daughter set off for sea side where they experience better treatment and decide to stay. May be coming out this fall in US. Lola Rose. Ne'er do well, abusive father. Ineffectual, pretty, foolish mother. Frumpy, unhappy daughter. Mother wins big in the lotto, father's tirade causes the rest of the family to run off to London. They buy themselves lots of treats, use up the lotto money. Mother gets nicer boyfriend but then develops breast cancer. Daughter tries to care for younger brother, but deus ex machina savior show up in form of supportive aunt. Dustbin Baby. 14-year-old girl who has fight with adoptive mother on her birthday retraces the steps that her life has taken since she was abandoned in a dumpster as an infant. After visiting foster mother and trying to find her birth mother, she connects with someone from her past who helps her to realize that her life has turned out okay. I did start to feel that the mothers needed to have some sense-- whenever they got money, they bought sweets and clothes and didn't plan ahead at all. Also, most of them had no career skills, and managed to survive through luck and the help of others. I don't think this is a very empowering message for young girls who might be in similar situations. This 1939 book is for highly motivated, very bright fantasy fans who have read everything else in your library and really, really want some heavy-duty Arthurian legend. The vocabulary in this lead me to read it with a dictionary by my side, and the concepts of friendship, world peace, and doing good in the world are handled very philosophically. That said, I enjoyed this. It has moments of humor, was beautifully written, and laid out the main story of Arthur and the knights of the Round Table in a fairly easy-to-follow fashion. The one thing that I enjoyed, but which gives me pause when recommending it to students, was the Arthur-Guinevere-Lancelot love triangle. The levels of stupidity on all sides was fascinating, and since the circumstances often devolved into chaos and violence, I think that it would keep the interest of those reading this for the action and adventure, but I doubt that students would have quite the interest in the soap opera quality of this sub plot that I did. I'm glad I got a copy. It's something that will challenge readers that I can hand to them more happily than, say, The Three Musketeers or Vanity Fair (which I finally deaccessioned because if I couldn't finish it after 20 years of trying, what are the odds that one of my students could?). I have worked my way through a large variety of Jacqueline Wilson books, but since I read 8 of them while in a sleep deprived, travel-exhausted state in Ireland, they all seemed rather the same and I'll have to regroup and sort them out. There may be a few of them published in the States; there may not. I visited several bookstores, and was vaguely appalled to find that Wimpy Kid is just as popular in Ireland as it is here. public libraries have in Ireland, it will be very difficult for me to complain about anything that happens, as long as I still have a job. Where am I? The Dublin City Library! When I get back to the states, I will post pictures of the libraries that I visited across the country. I have another week before I get back to the states, and I am missing reading already. Do have to stock up on some Jacqueline Wilson books for Picky Reader. Thanks for all the good wishes, and I'll be back very soon! Yes, the shame of not having read anything lately is causing me to leave town. No, I'm running away from home. Going far away, taking only The Once and Future King and one backpack with me. It's a good book, but hard to get through, and being stuck on an airplane for 10 hours with nothing else but the emergency evacuation instructions to read is a good way to get through something like that. When I read The Three Musketeers and Mutiny on the Bounty, it was on a trip to visit family in Iowa. I will be back and resume posting about July 27. Read the third Elizabeth Cody Kimmel Suddenly Supernatural book, Unhappy Medium. I love Kimmel's work, especially Lily B. She has a knack with creating real, interesting characters with whom I want to spend a lot of time. Kat and her friend Jac are going to a summer music camp-- since in the last book, Jac was torturing her mother by wanting to give up playing cello, she swings a deal that allows Kat to come to camp with her. Of course, Kat sees a ghost as soon as she gets there-- and the problem is that the ghost thinks Kat is the one who's the spirit. Nicely tied together with information about historical interest in the supernatural, this also addressed Jac's interest in a violin player and well as the relationship between Jac and her mother. Don't be put off by the horrible binding and the slightly large print-- these are great books. I'll be recommending them to Picky Reader in the fall. Also read the second Kevin Emerson book, The Sunlight Slayings. Oliver thinks he has killed his new human friend, Dean (although he really can't remember details of the night) and is somewhat relieved when Dean comes back as a zombie. Now they can hang out together. However, it seems like Emalie is trying to kill other vampire children using an old curse that makes sunlight come from inside of them and turn them to dust. Oliver's father is on the case, but obviously, Oliver is much more capable of solving the crime. I like the way that Emerson makes up whole vampire mythologies and explains them quite effortlessly. There are enough ooky, blood-based meals to entice the middle school boys. All in all, I like these MUCH better than Heather Brewer's books, which are wildly popular at my school. It's nice to see a vampire book in which the main characters are NOT named Vlad. I'm looking forward to reading books three through five. It happens every summer. Nothing sounds good to read. I did finish another Clique book, Sealed with a Diss, but it was really, really awful. Unrealistic, whiny, and the designer clothes name dropping means it is already dated. Not that I got the references. Started to read Inkdeath, but don't have the heart. Picky Reader has started in on the Chronicles of Narnia and is liking them, and since it's been 30 years since I've looked at them in earnest, perhaps that is what I will do next.